With the introduction of the newfinance module, TrakIT contains a lot more sensitive data than it used to. Although, finance information is tightly controlled by finance roles, finance related data fields added to custom or advanced reports are not restricted from curious users. In the latest update of TrakIT, you can create "Restricted" custom or advanced reports. Restricted reports are those reports to which only the creator of the report has access to (and System Administrators as well). An existing report cannot be converted to a restricted report and vice-versa. To create a new restricted report, simply select the checkbox when creating a new report. Once a restricted report has been created, it will have a icon next to the report name. The report will be visible only to you and to System Administrators. Hence, other users will not be able to see fields or subscriptions being used in the reports. When creating a restricted report, please be careful of who you add as a recipient for the report as TrakIT cannot control who you send the report to. While it sounds simple enough, there are many other related changes with respect to reports and status updates that will need to be changed. Contractual Customer is now Mandatory - The Contractual Customer field has switched places with Shipper/Receiver is now the first field to be filled when creating a new work order. Change of Contractual Customer and Shipper/Receiver always apply to T/D - When modifying a work order header, changing the contractual customer or shipper/receive will always apply to the whole shipment and cannot be changed on individual work orders. The check-boxes for "Apply to T/D" will always be disabled for Contractual Customer and Shipper/Receiver. For any questions or concerns regarding the current and upcoming changes, please contact TrakIT Support. With the latest update, we've added the Contractual Customer's credit status to display on the Finance Job page. Additionally, a "Details" link has been added next to the Weight/Volume field to display details for individual work order. 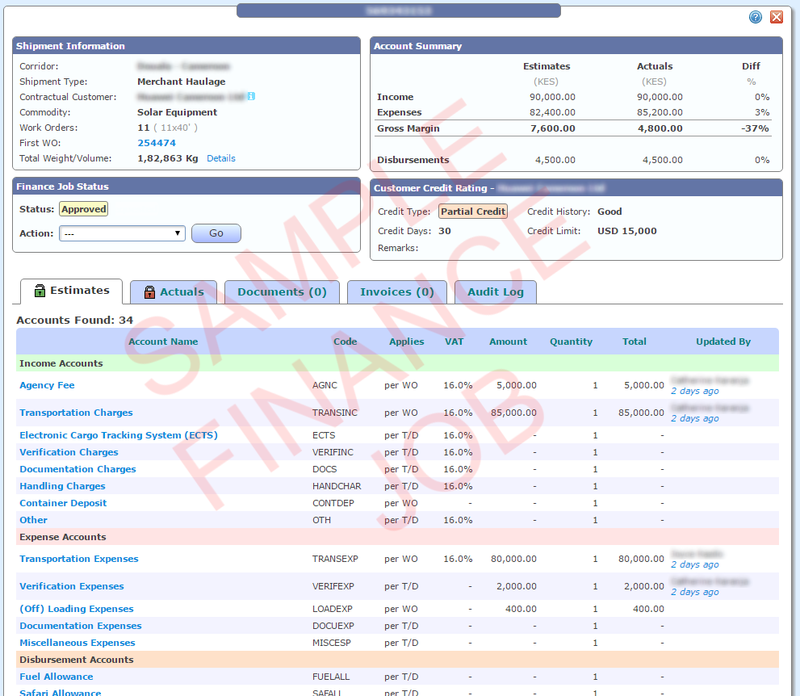 The Income, Expense and Margin columns are now displayed on the Finance Summary page as well.